We adopt a 7-day cycle system with six periods a day. Lesson starts from 8:00 a.m. to 3:30 p.m. every Monday to Friday. 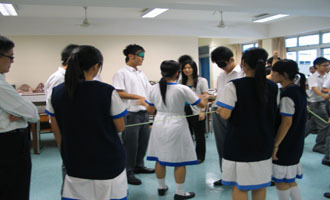 S1 students can join the Chuen Yuen Peer Counseling Scheme in which S4 students will take care of S1 students so that they can adapt the secondary school life more easily. There are two tests and one examination in each term. Continue Assessment contributes 30% of the total marks. Criteria for promotion are the overall pass of the total mark and pass in the core three subjects, namely, English, Chinese and Mathematics. There are two parents’ days, one in November and one in February in each year. Lessons of Moral and Civic education cover all the essential elements to nurture a youth. Topics include self-understanding, interpersonal communication, emotional management, value education etc. Moral and Civic education is very important and community services, voluntary works and discussion forums will be conducted throughout the year.